Добавить в корзину 1 шт. на сумму 22 руб. TDK VLS6045 series wound ferrite inductors are magnetically shielded for power circuits. 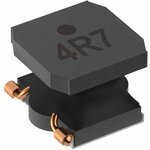 These wound ferrite inductors have a high magnetic shield construction achieved by a ferrite magnetic material and are compatible with high – density mounting. Larger current and lower Rdc have been achieved by optimising the ferrite core figure.